This elegant folding lid gift box for a single Small coin capsule is packed with tons of great features! The lid of this box folds over the base and snaps into place using a magnetic closure. Inside the coin capsule rests in a velvet covered black insert. The insert has a easel tab which can be pulled out, allowing the insert to be displayed standing up inside the box. 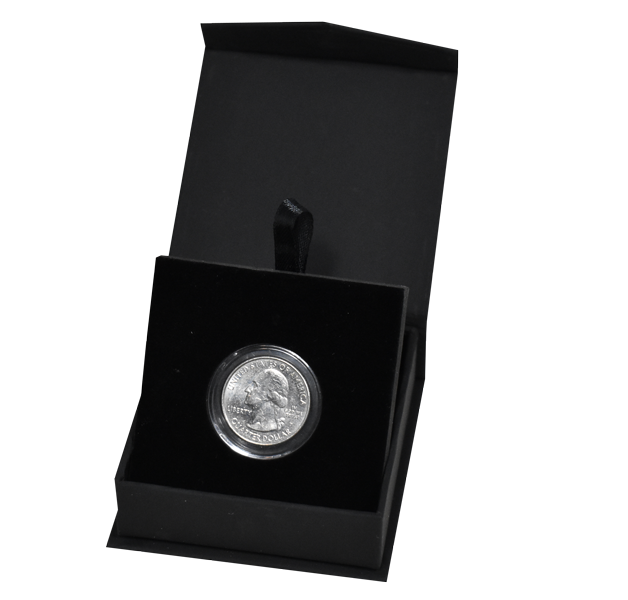 This coin capsule box is ideally suited for corporate or challenge coin presentations on a budget. Please inquire over at information@coinsupplyexpress.com to be accommodated accordingly.